Armadillo's Founder Justin Hoon is an Equine Sports Therapist. He has been using magnets as part of treatment for many years. Used only at rest, magnets are proven to aid healing, to reduce the risk of injury and to alleviate the symptoms of arthritis and similar conditions. They should only ever be used at rest and never during work as if an injury occurs, bleeding is increased by the magnets. 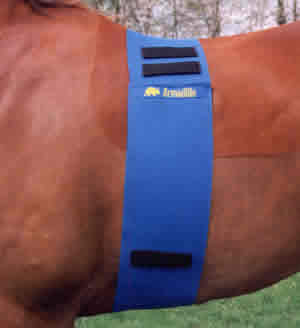 Armadillo's Magnetic Wraps, Winner of the BETA New Products Award, can be wrapped anywhere around the body of the horse or rider, allowing magnetism to be applied exactly where it is needed. 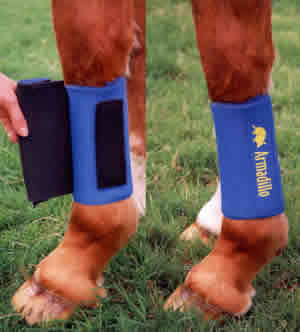 Great for yards where many horses can be treated for their individual problems all with one product. This versatile product replaces the need to stock many different magnetic products.